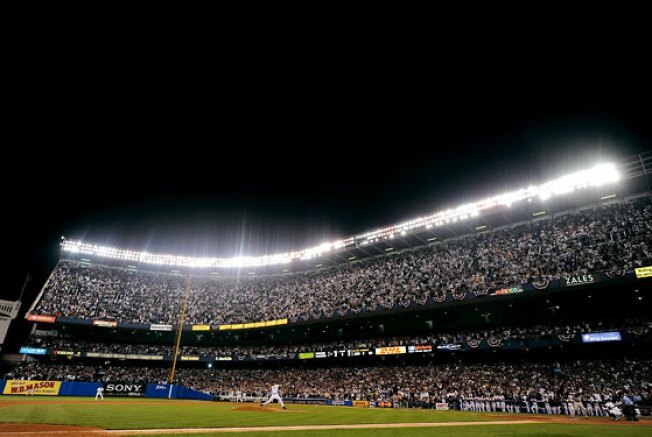 Above is an image from last night's game at Yankee Stadium, the last ever in the legendary ballpark. Greats like Yogi Berra, Whitey Ford, Reggie Jackson, and Bernie Williams showed up in the House That Ruth Built, and Babe's own daughter, Julia Ruth Stevens, threw out the opening pitch. We'll have a report from one of our writers who was lucky enough to get tickets later in the day, but just in case you were keeping score, the Yanks beat the Orioles 7–3, staving off elimination for another game. Their 85-year record in the stadium was left at 4,133–2,430, with seventeen ties.